Participants from the academe, private, and government sector pose for a picture with the speakers during the Renewable Energy for Agriculture Symposium. The recent developments and changes we are experiencing imply that there is a great need for energy. This need for energy is not only evident in agriculture but also in industries and even in our daily lives. 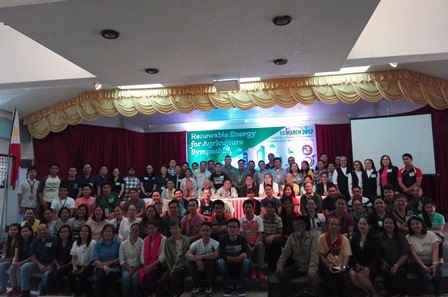 A day after the Regional Scientific Meeting, the National Academy of Science and Technology (NAST) together with the Southern Mindanao Agriculture Aquatic and Resource Research and Development Consortium (SMAARRDEC) held the Renewable Energy for Agriculture Symposium at the University of Southeastern Philippines. The symposium was conducted to determine the current state of knowledge and practice of renewable energy in the field of agriculture. Academician Eufemio T. Rasco, Jr., Chair of NAST Agricultural Sciences Division, stated that renewable energy alternatives should be explored in order to support the persistent demand of energy in the farming sector. "If you look into the cost of mechanization, the bulk of it is fuel," Rasco said. He cited that the fluctuations in the cost of fossil fuel indicate that there is an on-going energy war. As an avenue to discuss and promote the development and utilization of renewable energy for agriculture, the symposium had speakers presenting researches and milestones on the practice of renewable energy for agriculture. One of the speakers, Dr. Manuel Regalado of Philippine Rice Research Institute (PhilRice), discussed Renewable Energy Transformations and Applications. He introduced the term ‘Cruzesterification', a process developed by a Filipino researcher to convert used cooking oil into biodiesel. 12L of used cooking oil could produce 8L of biodiesel. He also added that there is a pilot-scale growing of microalgae for biodiesel production in Tagpako,Gingoog City, Misamis Oriental. With the various sources of renewable energy, it is only a matter of time that fossil fuel would be defeated. "Winning this war is all about making choices," Rasco emphasized in his message. And it is our call whether we're up for the challenge to make the right choice and contribute to the success of renewable energy.